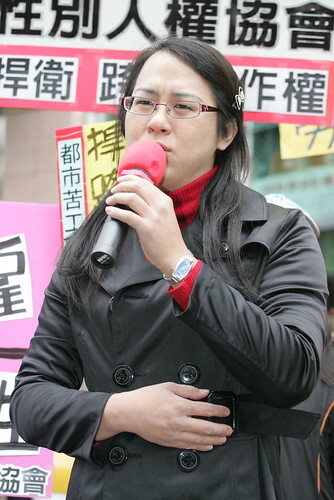 Taipei's labour bureau ordered Mackay Memorial Hospital to pay $1,700 (£1,000) for firing computer technician Chou Yi-jen last year. The 35-year-old had been working at the hospital for five years when he started wearing women's clothes. The case is believed to be the first of its kind on the island. The hospital eventually fired Mr Chou, insisting the dismissal was unrelated to his cross-dressing, and was due to his job performance. But labour officials told the BBC that Mr Chou had been verbally abused by supervisors and was required to seek permission to go to the bathroom. They said they hope this case will serve as a warning to employers not to discriminate against workers. It is not clear whether Mr Chou will get his job back. Taiwan is famous for filmmakers such as Ang Lee, who produced internationally acclaimed films such as 2005 Oscar-winner Brokeback Mountain, about a gay cowboy. But it is still grappling with how to fairly treat transvestites, homosexual and bisexual people.